GOP governors offer alternative Medicaid reforms, but who's listening? Governors are analyzing the House Republican bill to restructure Medicaid and phase out the Obamacare expansion of the program, and they don't like what they see. The letter “does give a little more oomph to nervous senators who say let's not rush into things,” said Joe Antos, a conservative health policy expert at the American Enterprise Institute. House GOP leaders seem to have heeded some of their requests, which are partly reflected in an amended bill released Monday to repeal and replace the Affordable Care Act. State leaders and advocacy groups are sounding alarms over the likely impact of the American Health Care Act on patients and providers. Arizona's Medicaid agency found that 380,000 residents would lose Medicaid coverage by 2023, and the state would get $2.5 billion less in federal funding. By 2030, 600,000 fewer Coloradans would have Medicaid coverage, and the state would lose $14 billion in funding, the Colorado Health Institute reported. Ohio would lose $19 billion to $25 billion in federal Medicaid dollars between 2019 and 2026, according to an independent research group's analysis. Prodded by both Republican and Democratic governors, some GOP senators and congressman are urging Republican leaders to change the legislation—which the Congressional Budget Office said last week would reduce federal Medicaid spending by $880 billion, or 25%, over a decade—to mitigate the likely coverage and dollar losses. That's why the four Republican governors offered congressional GOP leaders their own detailed proposal last week for how to recraft the program's financing overhaul. In their letter, the four governors seemed to be pleading for Congress to slow down and do Medicaid reform right, saying lawmakers should focus first on stabilizing the private insurance market. Some congressional Republicans are sympathetic to the state leaders' worries. 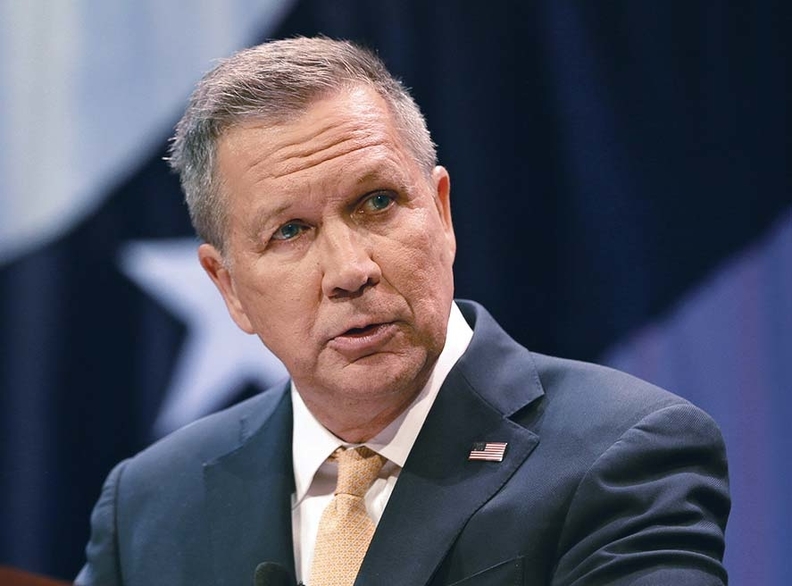 “I also share their concerns about the need to protect the Medicaid expansion population and give governors more flexibility to ensure they can design programs that meet the needs of their states,” Ohio Sen. Rob Portman, whose state has expanded Medicaid to about 700,000 people, said in a written statement. GOP Sen. Dean Heller of Nevada said last week that he could not vote for the current House bill because of the Medicaid concerns raised by the governors. But it's unclear whether congressional leaders will fully consider the major changes the governors have proposed, especially given that they want the House to vote on the bill later this week and the Senate to pass it soon after. The four governors argued the states should be given the choice of moving to a per-capita cap or block-grant model or keeping the current federal matching structure, with a phase-out of enhanced federal funding for expansion enrollees. The block grant option was included in the amended House bill that came out Monday. But there's no option in the bill to retain the current matching payment system. The governors' version of per-capita caps on federal payments would be more flexible and nuanced than the version in the House bill. It would take account of economic downturns and variations in underlying medical costs, rather than being chained to the medical component of the Consumer Price Index. It would phase in spending caps for each beneficiary group, giving states more time to address the complex issues involved. And the funding formula would set a minimum per capita amount and adjustments for relative state poverty levels to promote equity among the states. All those features, however, could weaken the constraints on federal spending, which wouldn't make conservatives in Congress happy. The amended version of the AHCA released Monday makes another change consistent with what the governors proposed, softening the impact on one highly vulnerable Medicaid beneficiary group. It would set the growth rate of capped federal payments to the states higher for elderly and disabled beneficiaries than for other types of beneficiaries. The governors had urged that federal matching payments to states for the elderly and disabled not be capped. The governors also offered a wide range of ideas for giving states greater flexibility in operating their Medicaid programs. For instance, under a per-capita grant or block grant model, states could continue to receive enhanced federal funding for Medicaid expansion but would be able to set eligibility at levels below the ACA's current threshold of 138% of the federal poverty level. That's contrary to the amended House bill, which would phase out enhanced federal expansion funding in 2020 and bar any new states from expanding Medicaid coverage. Under the governors' proposal, states could choose to block-grant long-term care services and supports and establish it as a separate Medicaid program, with institutional care and home- and community-based care put on a level playing field. If states opt for the block grant model, the federal Medicare program would pick up Medicare cost-sharing for beneficiaries dually eligible for Medicaid and Medicare. They also urge giving states sufficient flexibility in designing their own Medicaid programs so that the federal waiver process would be virtually eliminated. Corlett expressed concern about some of the governors' proposals, such as setting work requirements, eliminating presumptive Medicaid eligibility and making benefits such as early childhood screening optional. But overall he welcomed their contribution and said it would behoove Congress and the country to have a broader, more deliberate discussion before making big changes in Medicaid. But the American Enterprise Institute's Antos said congressional Republicans are not going to pause and debate the governors' Medicaid ideas. He predicts they'll hold their noses and vote for the GOP repeal-and-replace bill.